Relations between the US and Venezuela were already fraught before President Trump backed Mr Guaidó as leader. Venezuela broke off diplomatic relations in response while Mr Trump said the use of military force remained “an option”. 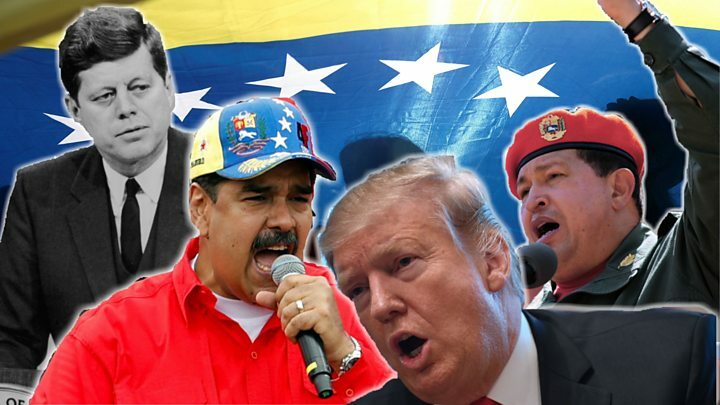 The Trump administration was one of the first to support Mr Guaidó as interim president and declared Mr Maduro’s re-election last year “illegitimate”. The US has also imposed a raft of economic measures on Venezuela, including against the state-owned oil company, PDVSA, aiming to hit the country’s main source of revenue. It has criticised Mr Maduro’s increased use of the courts and security forces to suppress political opposition. Mr Maduro – who still has the support of Russia and China and, crucially, of the Venezuelan army – said he did not see the need for early presidential elections.